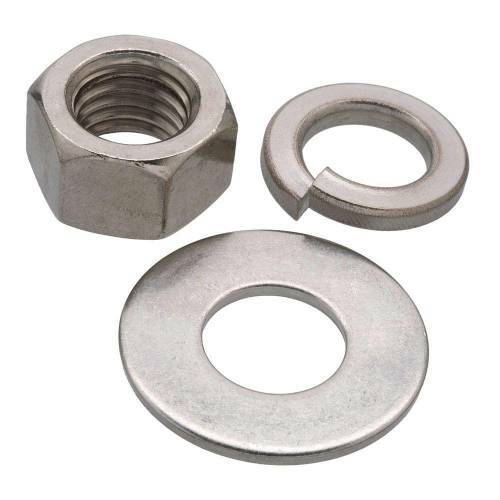 Swarna Fasteners, being one of the paramount Stainless Steel Hex Nut Manufacturers in Delhi, have best personnel and plant to manufacture a wide range of nuts and other fasteners. Our range is known for their quality, durability and longevity, thus, we guarantee that your selection won’t go wrong. We always use good quality raw material and technology to manufacture our wide range, so, you’ll get the final finished products that give you value for money. Protective Surface: Stainless Steel is the metal that creates an extra protective layer and prevents any damage and also ensures self-repairing. Thus, you should give it a try for your fastening applications. Prevent Corrosion: It doesn’t let the corrosion accumulate on the surface and ensure the long-serving life of the hex nut. It not only prevents the Hex Nut but the material it is installed onto as well. Wide Range Available: You can avail hex nut in different sizes, standards, grades, materials and quality to meet the specific needs of our clients. Being one of the peerless SS Hex Nuts Exporters and Suppliers in Ludhiana, India, we take the responsibility that you’ll get nothing but the best for your fastening applications. Contact us today to place your order or to enquire more.